Counting coins can be slow, tedious work. Thankfully, coin sorters can help automate the process. Anytime you’re dealing with substantial amounts of coins, you’re going to want to get a counter involved. Whether you’re a business or an individual, it just doesn’t make sense to manually count any significant amount of coins. A trip to the bank each-and-every time you want to deal with change isn’t a great solution. And even if your business was directly across the street from a coin counting service, you wouldn’t want to incur counting fees again and again. 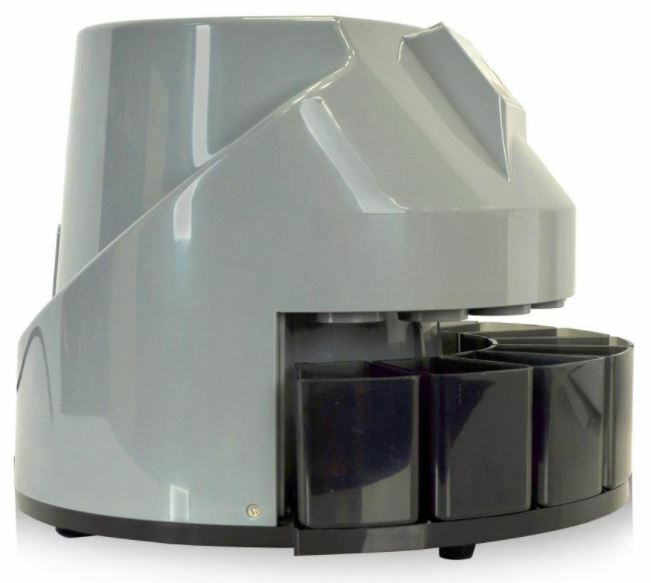 Relative to coin counting services, electric coin sorters can pay for themselves. 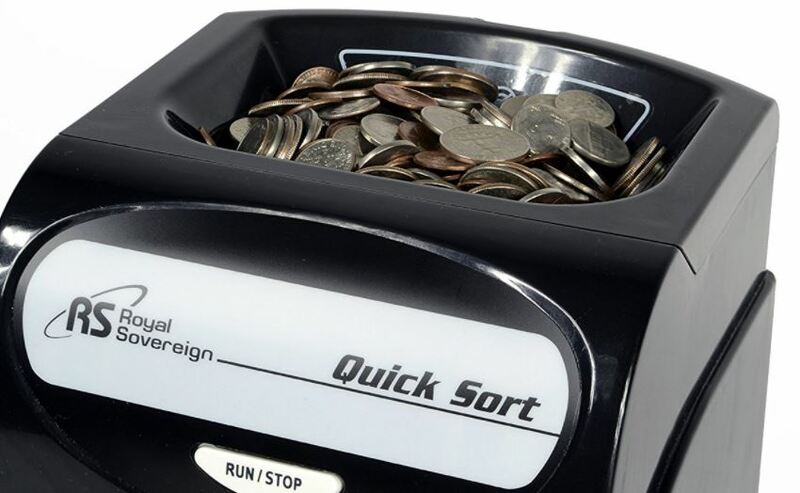 A good coin sorter will help you quickly and efficiently count your coins. But what kind of denominations does the machine support? And how fast is the counting speed? When you’re buying a coin counter for loose change around the house, you don’t have to worry much about the performance of your coin sorter. But for the purposes of a business, reliability, accuracy, and speed are non-negotiable. When selecting an electric coin sorter, you’re going to want to think about the way you intend to use the device. For example, do you need battery power? Battery powered counters tend to be smaller and more portable, making them useful for people who have to do coin-counting on the road. However, being battery powered ensures the device isn’t well equipped to take on pounds of currency every day. It’s important to know precisely how you intend to use your coin sorter, allowing you to prioritize and emphasize sorters with the features you need. How many coins are you going to be counting at one time? If you’re a small business that only counts coins at the end of the business day, you probably don’t need a machine that can accommodate 3,000 coins simultaneously. But even for smaller coin loads, if you don’t want to spend much time babysitting your coin sorter, then you’ll want a machine that can hold at least a few hundred coins simultaneously. Capacity for more throughput is something you’ll find on larger electric powered devices. If you’re dealing with higher throughput of coins, then a larger machine will help ensure you’ve got the capacity to never have your workload back up under a slow machine. But you don’t have to be in a hurry for speed to be a reasonable concern. Nobody wants to sit around watching a machine count coins as slowly as a human being. High speed counting gets your task done and you out the door. Speed can be particularly valuable if you want to count your coins twice in the interests of error detection. Two more things to think about are the durability of the machine, and where your coins will end up being sorted. Mechanical measuring equipment with moving parts will always be prone to breaking down. You don’t want a machine that’s going to fail after one year of regular use. Even worse, you don’t want a machine that’s going to break and give you no indication that something has gone wrong in the counting process. A machine that can help you wrap your coins may save considerable amounts of time. But whether or not you need your coins wrapped affects the capacity of the device, and how much attention you’ll need to give the machine while it’s sorting. 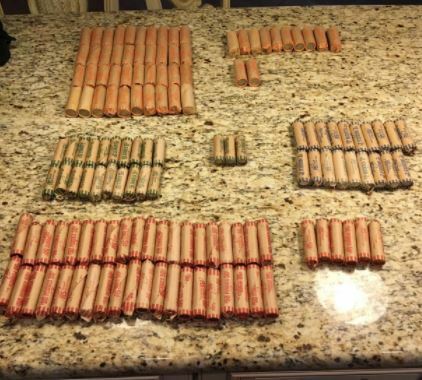 Imagine you were counting a jar of change that was primarily full of nickels. Each time the coin sorter’s nickel counter filled up, you’d have to get involved and remove the counted change. If you don’t care about counting wrappers and you’re only interested in counting and sorting currency, then you’ll want a device built specifically with those features in mind. The Cassida C200 makes use of a highly compact design that’s well suited for small retail operations, vending businesses, and other cash-only operations. 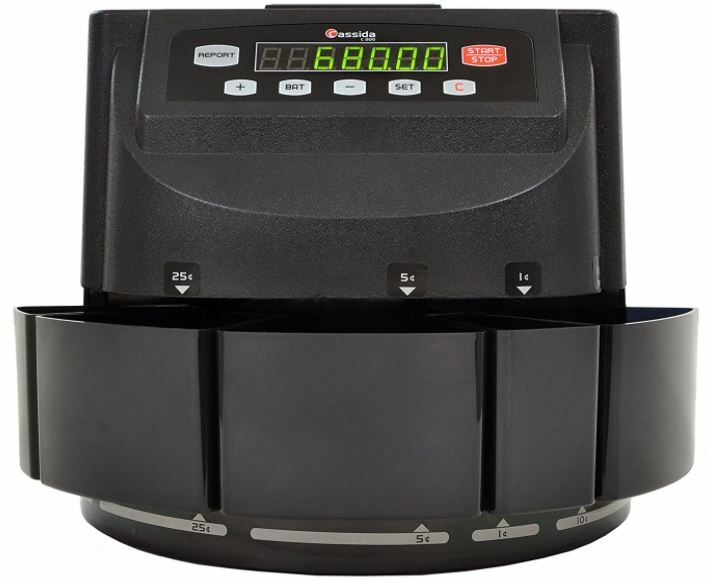 Among its most essential features, the C200 will count your coins by denomination, add up the total amount of currency it has processed, or prepare for a special batching mode to help you get through your counting extra quickly. After being counted, the C200 drops your processed coins inside cylinder-shaped coin tubes. All you have to do is place coin wrappers into the included coin tubes, and tie off the wrappers once the tube is filled. But the C200’s most interesting feature is its batching mode. That mode allows you to create a batch of coins of a particular denomination. After a pre-determined batch amount has been reached, the C200 will stop what it’s doing and alert you. Like any modern digital coin counter, on the front of the device you’ll find an LCD display with intuitive interface. Here you’re able to view batch totals, data reports regarding the denomination totals, and set up the parameters counting session. The batch mode will count amounts between 1 and 500 coins, so you can load the machine up, press the start button, and feel free to leave the room. When a wrapper is full, the C200 will automatically stop. The C200’s 300 coin per minute counting speed helps you get through considerably sized volumes of currency with rapid speed. The coin hopper on the top of the machine can hold as many as 2,000 coins for processing, ideal for anyone who is processing a large quantity of coins, and doesn’t want to babysit the machine doing the counting. The C200 recognizes and sorts all common denominations, including nickels, dimes, quarters, pennies, and full dollar coins. Unfortunately, half dollar coins and other uncommon coins aren’t supported. 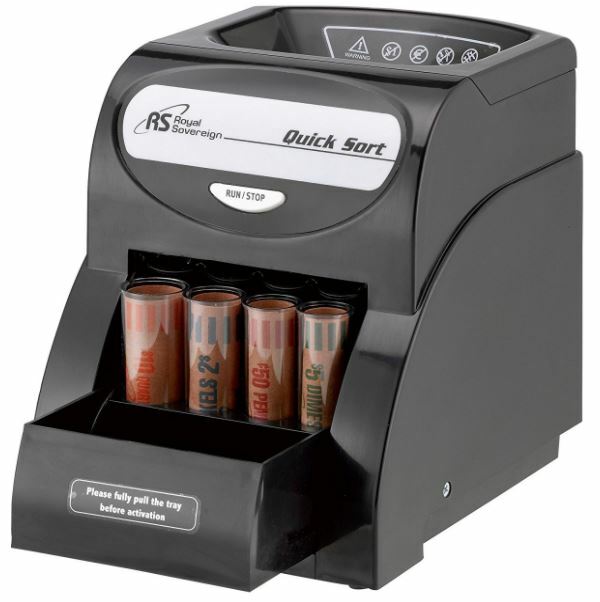 The Royal Sovereign QS-1AC is a one-row sorter that’s ideal for the throughput of small businesses, or for individuals who are dealing with the small quantities of coins we all tend to accumulate. While it’s not the strongest, fastest, or most powerful coin sorter on the market, it’s got a strong price to performance ratio that warrants the attention of anyone with simple needs and a tight budget. As coins are counted, they’re dropped into awaiting coin tubes. Within these tubes you can place counting wrappers for an easy transition between counting and rolling. Those tubes are also fully removable, making it easy to insert new coin wrappers, or take out coins that are ready to be crimped. In spite of the fact this device is a relatively inexpensive coin sorter, it’s compact 7.2 x 9.7 x 9-inch design has no problem retaining premium features. One such feature is anti-jam technology, which can help reduce the chances that you’ll end up having to pull a slightly warped penny out of the guts of the counter. Deformed coins are a fact of life, and if you’re counting more than a few hundred coins, you’ll find that deformed coins tend to cause jams. But anti-jam technology helps minimize the amount of time you end up attempting to dislodge the jammed coin that’s so rudely interrupting your counting. When a jam does occur, Royal Sovereign’s Electric Coin Sorter is easy to fix by accessing a small screw neat the top of the machine, allowing you access to the internal structure of the device. Royal Sovereign’s QS-1AC has a maximum 156 per minute coin speed, and can hold as many as 200 coins at once. Clearly that will present some small issues when it comes to throughput. The 200-coin capacity could potentially be stressed by any average person’s change jar. 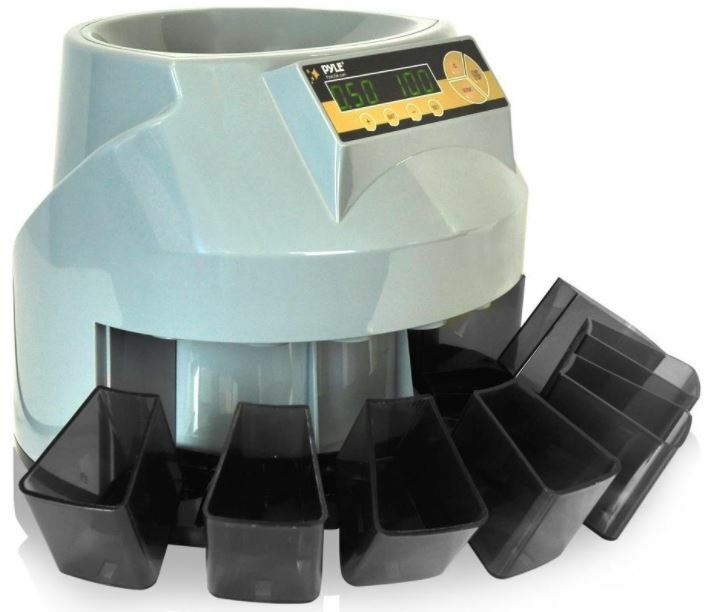 The fact there are only four coin tubes on this device means your counting will be stalled if you have a disproportionate number of one denomination versus another. Additionally, the QS-1AC is only equipped to count pennies, dimes, nickels, and quarters. But for the purposes of most people, that should prove to be more than enough. Pyle’s counter is somewhere in the middle ground between the type of coin sorter you would give to your grandmother to use around the house, and the type of coin sorter you’d give a business that deals exclusively in change. 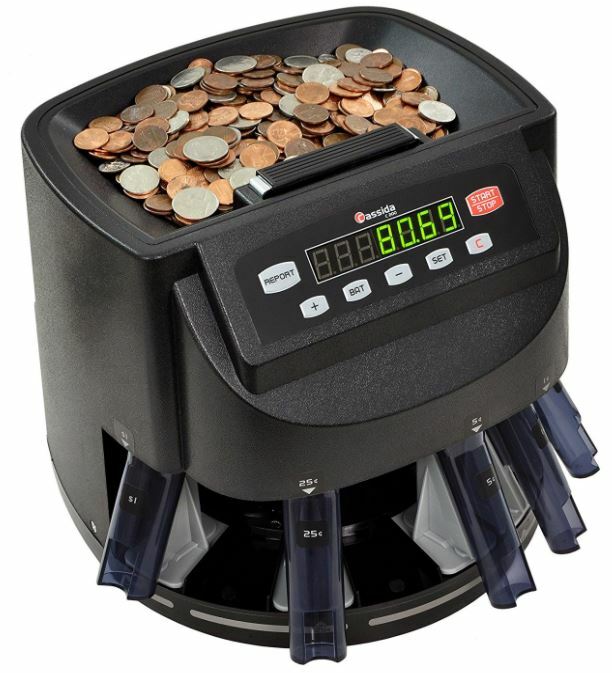 This sorter won’t wrap your coins for you, but it will provide hassle-free counting for large batches of coins. 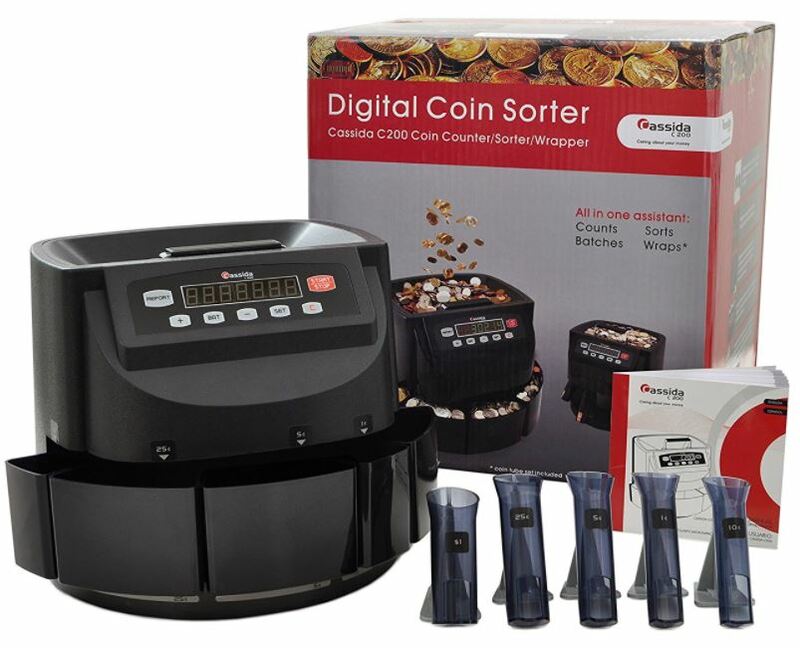 If you’re interested in counting and sorting coins, but don’t want to sit around and micromanage coin-wrapping, then this sorter is worth your close attention. Pyle’s counter will sort or group coins according to their variety. It has two counting modes, either free count or batch count. For free count, the machine will display the total value of the currencies that have been counted. For batch count, you’ll see the specific values of all the various denominations that are counted. 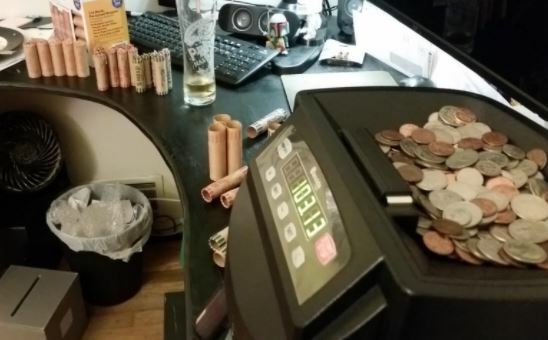 The problem with your coins ending up in rolling-coin cylinders is that those cylinders rapidly fill up. That means you either need someone to babysit the machine and proactively roll coins as counting occurs. Pyle’s solution to the problem is to forget coin counting entirely and sort coins directly into trays instead. Unlike many other coin sorters, Pyle’s sorter has universally compatibility for all US currency. That means you’ll have no trouble sorting through even relatively obscure coins like dollar and half-dollar coins. It also boasts a maximum counting speed of 216 coins per minute. Although that speed may not be enough for a busy bank, it should be more than sufficient for virtually everyone else. Finally, it’s worth noting that Pyle’s counter has been constructed with a bulky 14 x 13 x 10.4-inch design that’s going to require a fair amount of counter space. On one hand, that larger design is what allows Pyle to use an impressive 500-coin loading tray, which will help reduce the amount of time you have to spend interacting with your coin sorter. On the other hand, that larger design is also what contributes to the weighty 14-pound build of this device. For choosing the right coin sorter, much of your decision comes down to the kind of throughput that you’re going to need. 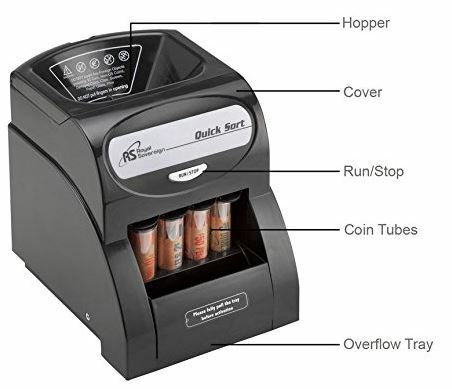 If you’re dealing with smaller quantities of coins that are all in ordinary denominations, then you most likely want Royal Sovereign’s coin sorter. It’s adequate for businesses that are working with small but consistent quantities of change, and it’s inexpensive enough to make it a great pick for coin sorting around the house. But if you’re dealing with higher quantities of coins and need greater throughput, then you want the Cassida C200 coin sorter. It’s ready to take on 2,000 coins at once, allowing you to place your coins and leave the room as it swiftly counts your currency. That giant coin capacity is paired with an equally strong 300 coin per minute counting speed. For people with cash-only businesses, or people who deal almost exclusively in change, the C200 is a great buy. Not everyone cares about wrapping their coins. 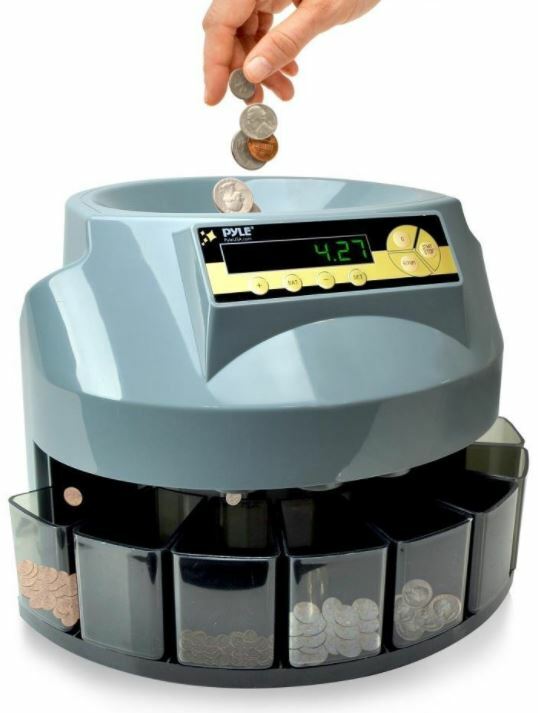 If you’re only looking to count and sort your coins, then you want Pyle’s automatic coin sorter. It has the ability to hold up to 500 coins at once, which ensures you won’t have to spend much time micromanaging the device. The relatively fast 216 per minute coin counting speed helps guarantee you won’t be waiting around long for your results. To sweeten the deal, Pyle also counts dollar and half dollar coins, making it the most versatile counter on this list.